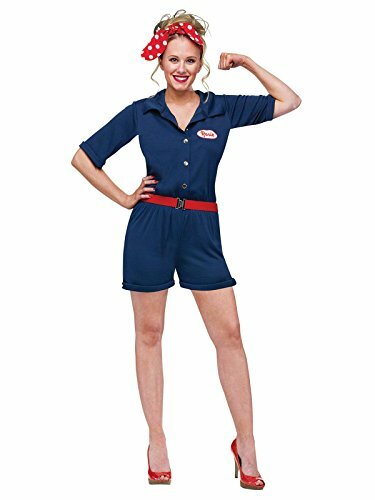 Today I want to bring you a Rosie the Riveter costume tutorial, a perfect pop cultured themed ideas for cosplay and Halloween parties. The name first appeared in the song of the same name in 1942 written by Redd Evans. The song describes Rosie as an assembly line worker doing her part to help in the war. In the time of World War II the male role dominated over women and they were normally found at home taking care of the kids and the house. She was and still is a iconic cultural icon across the world. This icon represents women who worked in factories during World War II. The women in these factories generally made and produced ammunition and war supplies for the soldiers in the army. The name is also widely used as an icon for feminism and economic power in women in today’s generation as well as during the war. Here are two items you can use for the three different styles below, you have the navy blue work suit along with the black curly wig. Further information on how to wear them is below. 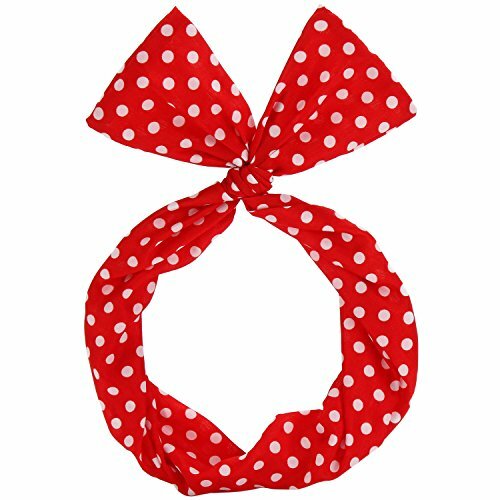 To create the right bandanna style you will need to try to find a red bandana with white polka dots. Fold the bandanna over in a triangular shape and roll it up. You can make the bandana as wide or skinny as you would like. You will also need a tube of ruby red lipstick to accentuate the Rosie look appropriately. 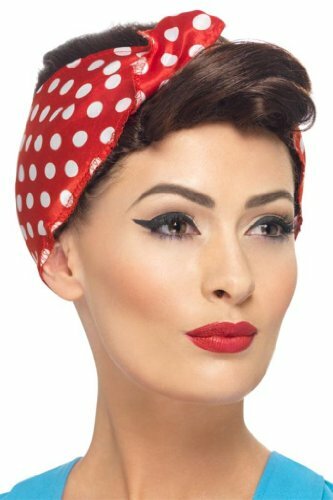 If you haven’t got a bandana to use yet there is one above that is perfect in the style of a 60’s pin up. There you have it the perfect cosplay that you will love. You will be sure to catch attention where ever you go. Tuck in a button up shirt into a pair of high waist jeans. Create an up do style with your hair and tie a red bandana around your hair, and finish off with a pair of work boots and a black metal lunch pail. Or you could wear a shirt with the sleeves rolled up and tucked into a pair of flare or wide-leg pants. You will also need a colored apron with no lettering to wear over the shirt. To complete your outfit wear a pair of work boots and a red bandana in your hair and use a drill as a prop. 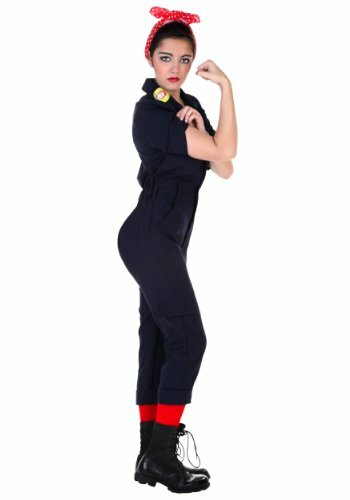 This last look is an original and widely known as being associated with Rosie the Riveter. You will need a shirt with the sleeves rolled up and a pair of overalls. Turn your hair into an up do of some sort, with a red bandana tied into it and a pair of work boots and a tool belt worn around the waist. Also you will need to pin an index card to the front of the shirt with the words “We can do it” written in black ink or hold up a copy of her famous poster. 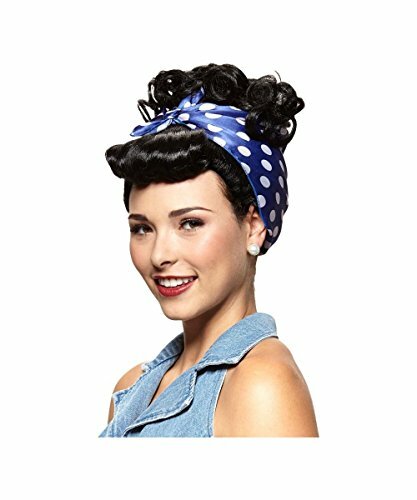 Here is another superb take on Rosie the Riveter from Halloweencostumes.com, with an option from Amazon which is great as you’ll have a backup come September and October when items can go in and out of stock quickly. It includes all you will need to transform quickly into this historical icon including jumpsuit and red bandanna. When World War II began the female population took over the males jobs while they went off to fight in the war. Honestly who else was going to support the home and children when the men were away. This caused a drastic change in male and female roles in America after the war ended because women left the homes to continue working and being independent. Whereas in that day and time men believed the rightful place for women was at home with the children. According to statistics, “Rosie the Riveter” inspired a movement that increased the number of working American females from 12 million to 20 million by 1944. In 1944 only 1.7 million men between the ages of 20 and 34 worked in the defence industry, and working women jumped to 4.1 million and counting.